The Hunger Games Movie Mockingjay Prop Rep Pin has 4.5 Stars from over 100 Reviews. If you are a Huger Games fan or know someone who is then this would make a great gift! 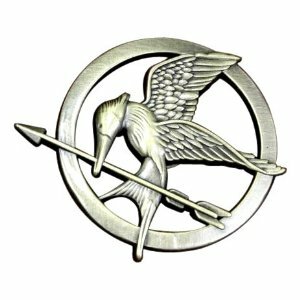 This is the classic design of Mockingjay Pin. This is on any Hunger Games fan’s must have list at the moment! This Mockingjay Pin is made of metal and measures about 1.5 inches. Those who wear it are sure to identify themselves are true Hunger Games fans! LeapFrog Leapster 2 Game System just $35 Shipped! The Children’s Place: 30% Off Already Reduced Items + $5 Deals + 15% Off Coupon Code + FREE Shipping!